Every now and then the clocks stop and the sun hangs in the sky. We stepped out on the patio to just such a moment this morning. It didn't erase or even ease the problems of the day but as we sat looking at a single leaf on the apple tree we realized we were happy. It was not a beautiful leaf, nor a young one glowing with promise. With a puff of the breeze, its stem will snap and it will flutter to the ground like all the other leaves before it. But my how golden it shown in the backlit sunlight for a moment. That's all it took to strike up the band, pop the champagne and toast life. Being happy has nothing to do with squashing one's sorrows. It depends on feeling the hot sun warm your hands in winter as your shadow falls across the cold bricks. 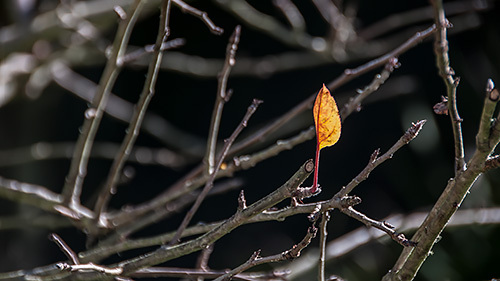 And a little leaf in its last moments waves hello to you.